Ape Snacks - under new ownership. Ape Snacks, the UK-based healthy snacks business, has been sold to an unnamed "private investor and brand owner operating in the food and beverage space". The London coconut snacks business, founded in 2016 by Zack Nathan, suggested the transaction will accelerate distribution of its products in the UK and overseas, whilst providing support to focus on innovation through products such as its vegan cheese flavour coconut puffs. Following the sale, Nathan will move away from the business to run his medical technology start-up full-time. He said: "Ape has been a fantastic journey with incredibly rapid growth." Charles Lanceley, director at investment firm Alantra, who advised on the deal, said: "Ape Snacks is a great example of a UK food brand that has responded to increasing consumer demand for healthy ingredients and, as a result, has grown rapidly over the last three years." 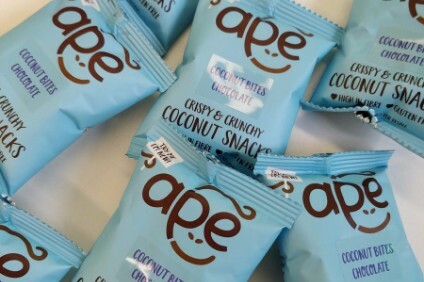 Ape produces a range of natural coconut based snacks that are sold through retailers including Tesco, Sainsbury's, Asda and Whole Foods Market. It made its 'big four' debut with a Sainsbury's listing last October. Its revenues have grown by more than 600% in the last two years.